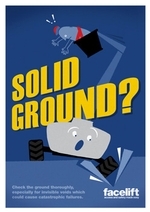 This safety poster highlights the need to consider ground condition when operating MEWPs. Ground conditions can be affected by weather, with rain and temperature, - and structure, including under ground voids, drainage and sewers, basements, man hole covers. The weight of the vehicle must also be considered, as this can damage surfaces, paving slabs and tiles.